$30 + postage and packaging or, inland UK £15 plus p+p. Here is the Introduction, and the Foreword by the Chief Rabbi. Calling people up to the Torah and reciting prayers for them afterwards is a skill that can take a while to acquire. 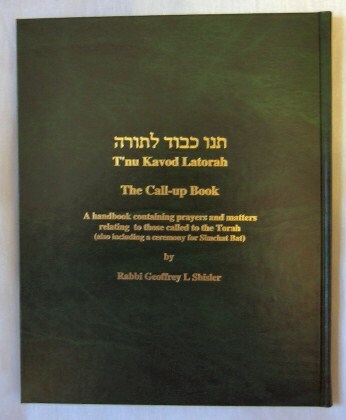 It needs quick wits and a good knowledge of Hebrew, and with the proliferation of Minyanim, many people are called upon to act as Gabbai who do not have the time to gain the necessary experience to carry out this function with efficiency.This book is intended to help them, as well as experienced Gabbaim, and provides a variety of prayers for many different circumstances. For example, as well as the traditional prayers, it includes prayers for couples who have just become engaged, as well as for those who are about to enter hospital.The supplement contains the correct way to say the Hebrew numbers, for those celebrating special birthdays or wedding anniversaries, as well as some useful information relating to the order in which Half-Kaddish is said when more than one Sefer Torah is taken out from the Ark, and the order of priorities for those to be called to the Torah. There is also a section on Laws relating to Reading the Torah. To make it easy to find appropriate places to stop when it is desired to call more than the statutory seven men to the Torah, there is a section containing suggested Hosafot.Although not related to the reading of the Torah, there is a Simchat Bat ceremony for those who wish to make a special celebration when naming their new-born daughter.I am appreciative of the Chief Rabbi for his kind Foreword and for his constant support and encouragement. I also wish to express my thanks to Elkan Levy, Rev Michael Binstock and Simon Goulden for their suggestions and advice, much of which has been incorporated here, and I am particularly grateful to Rabbi Daniel Roselaar for his invaluable help. I am truly grateful to Jacquie and Stuart Katz for their kindness and generosity in dedicating this book to the memory of their dear uncles. I hope that this book will assist in the smooth running of our services, and will be found useful by all those who are charged with the privilege of calling others to perfom Mitzvot.